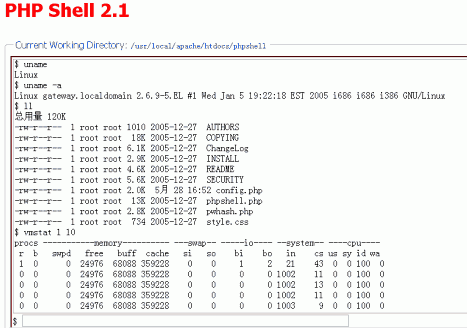 PHPShell is a PHP script which allows shell commands to be executed on a web server. Typically the PHPShell script is protected by a password so only the server administrator can access it. We deployed honeypots that advertise an unrestricted PHPShell application, which attackers often tried to exploit. Put the zipfile into your webserver. or you can use pwhash.php to generate a hashed password. explaination in the SECURITY file.